I will be traveling back from Montevideo to Amsterdam with a transit via Sao Paolo Airport. I found a previous thread which state that 1.30 Hours at the Sao Paolo Airport should be enough for transit. I will be traveling only with hand luggage and no additional bag (and willing to run in order to reach the gate, if need be). 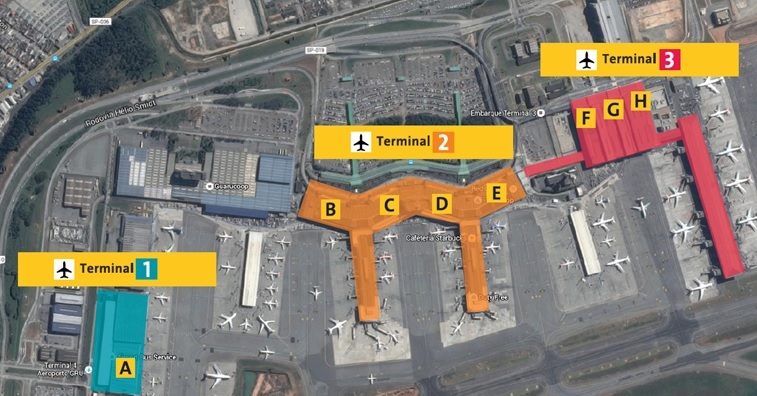 Are T2 and T3 terminals different buildings all-together and how long does one need to reach from one to another? I arrive in Terminal 2 and need to catch my flight in Terminal 3 and does one need to through security checks again? Went more deep to find some TripAdvisor Thread - Transfer fdrom T3 to T2 where I found the following image which shows the above mentioned walkway. The thread mentions that even during the Rio Olympics the person made from disembarkment area to the T2 terminal in under an hour. Not the answer you're looking for? Browse other questions tagged transit airports brazil sao-paulo or ask your own question.